In 1864, Minnesota granted settlers the right to homestead 160 acres at no cost. Settlers payed the land agent for the legal paperwork and had to build a house and live in it for five years. People started to settle in the area and the Village of Leavenworth was established. A priest from Mankato would come monthly to minister to the settlers in private homes. By 1867, there was a need for a church. Ten acres of land were purchased from Bernard Frey for the church. It was sold for $100 to the Right Reverend Thomas Grace, Bishop of St. Paul. John Joseph Schumacher and a few other men built a log house church that would hold 25 to 30 people. It was located in the middle of the current cemetery. Father Valentine Sommereisen who was ministering to Leavenworth at this time, thought it should be named Church of the Japanese Martyrs because three of the Martyrs were Jesuits and Father Sommereisen was a Jesuit and the 26 Martyrs were elevated to Sainthood in 1862. By 1875, more settlers were coming to Leavenworth and a larger church building was needed. The railroad had been established so supplies for building were available. A very nice church was built for $2,000. Some additions were added later for supplies and for a priest to stay overnight. The church was located in the area of the present rectory. By 1927, with more parishioners coming to Leavenworth, a larger church was needed. In 1928, a new church building was started. The cornerstone was laid on Sunday, Aug. 5. and a celebration followed with over 3,000 people attending. 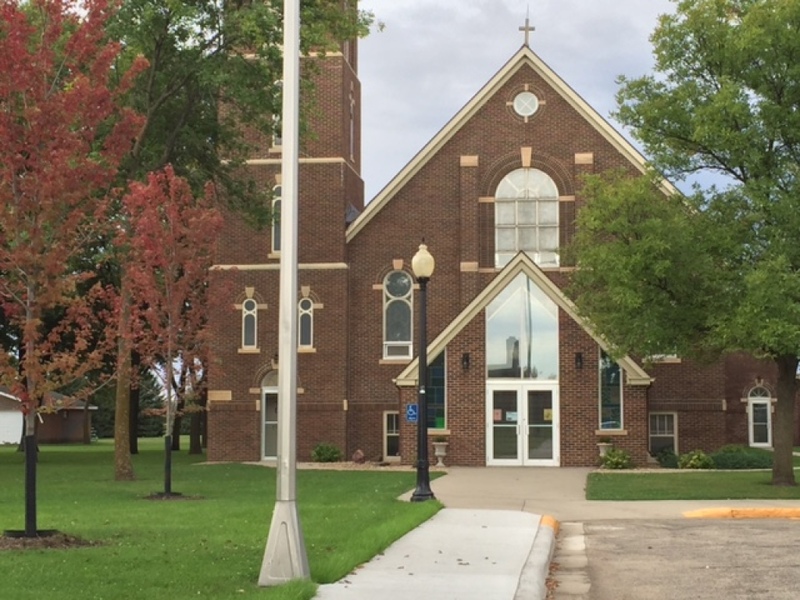 Many people liked to come to Leavenworth, a rural community with such a beautiful church—said to be the nicest rural church in southern Minnesota, built at a cost of $23,000. In 1951, Father Henry Sterner who was pastor of Leavenworth, requested that the School Sisters of St. Francis of Milwaukee, Wis., accept the teaching roles at the School of the Japanese Martyrs. It was his dream to have a Catholic School—forming the future of the church in Leavenworth. The Sisters agreed to come when it was built. The school was completed in 1952 and was for grades one through eight. The Sisters assumed the teaching roles in September of 1953, serving the education of the parish youth. Lay teachers joined the staff in 1972 and in 1973 Miss Rose Horton was promoted as the first lay principal of the school. In 1986, after having provided a quality Catholic education and a place for the youth of the parish to come to learn Catholic Christian values for 33 years, the school was closed and the students split off to the four area schools for education from then on.